A garlic butter naan is a variation on the classic Indian naan recipe that often accompanies an Indian meal. 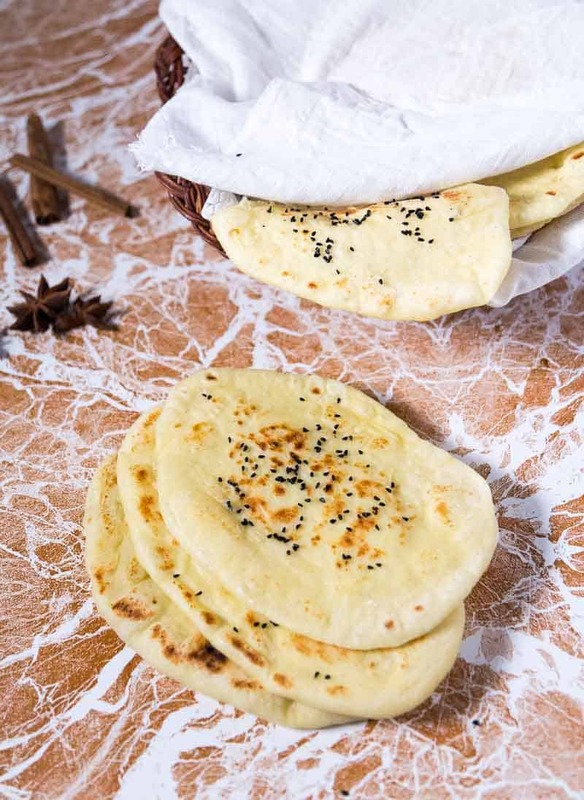 This simple, easy and effortless recipe makes a deliciously soft and chewy garlic butter naan that just melts in the mouth. 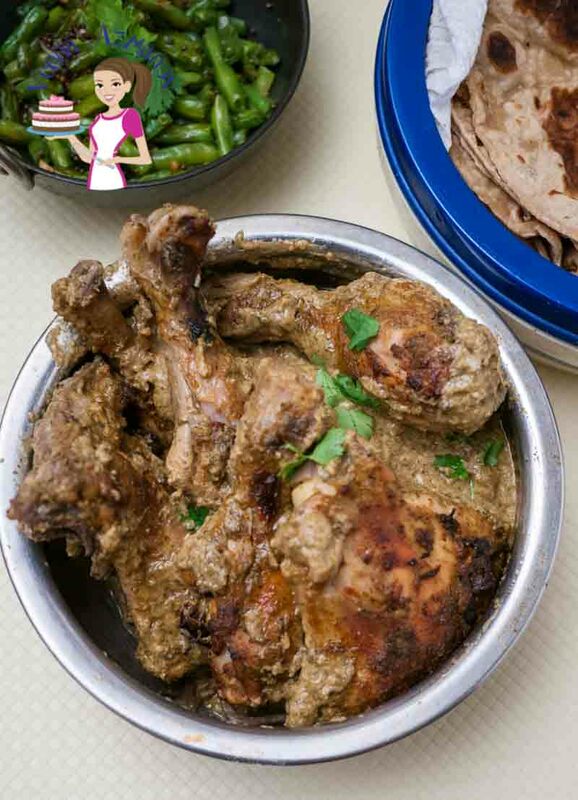 Serve it with your favorite Indian meal or enjoy it as a sandwich wrap too. If you love Indian food I bet you love naan. 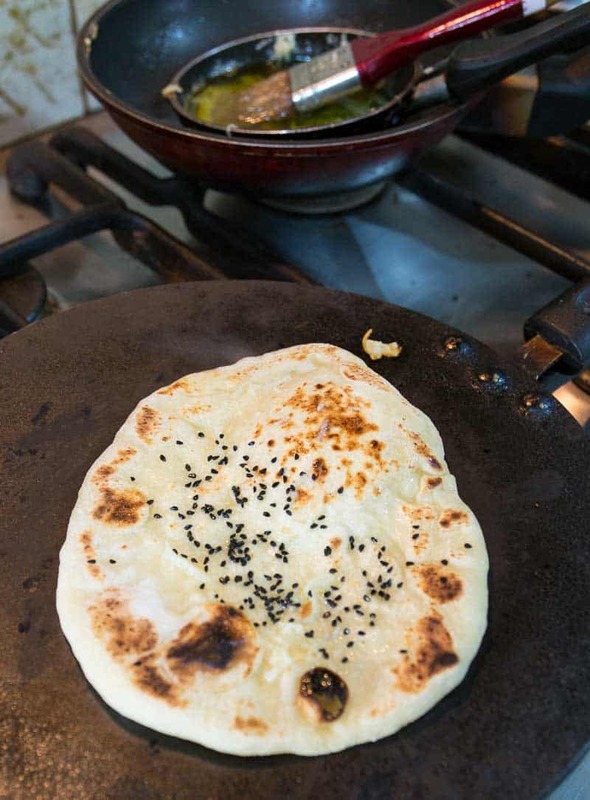 And of course, some of you will say… garlic butter naan. Right? I hear you, I am the same. I LOVE naan but I am crazy about garlic butter naan with nigella seeds on the top. The nigella seeds just make the naan so darn pretty!! 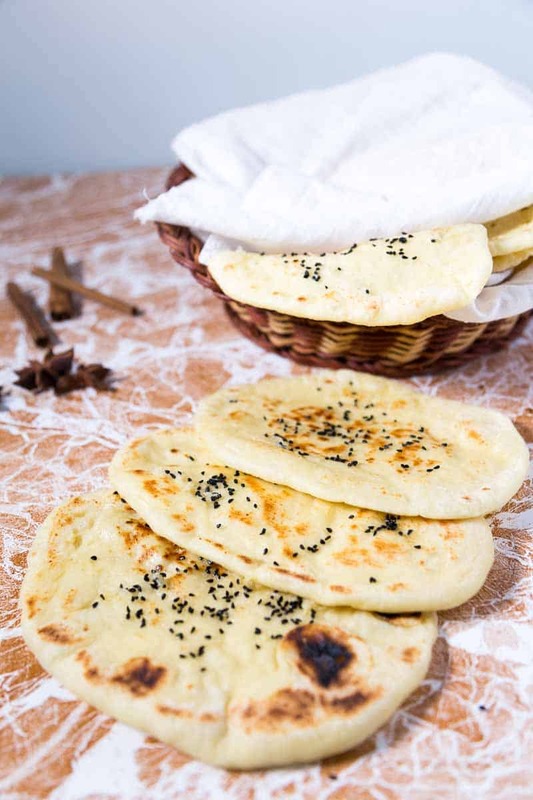 Do you know that naan is supposed to be soft and chewy? It really bothers me when I go to a restaurant and find a naan that’s tough like rubber. If you look at my video you will see that the naan really is soft. Well, you have to try it and see for yourself. 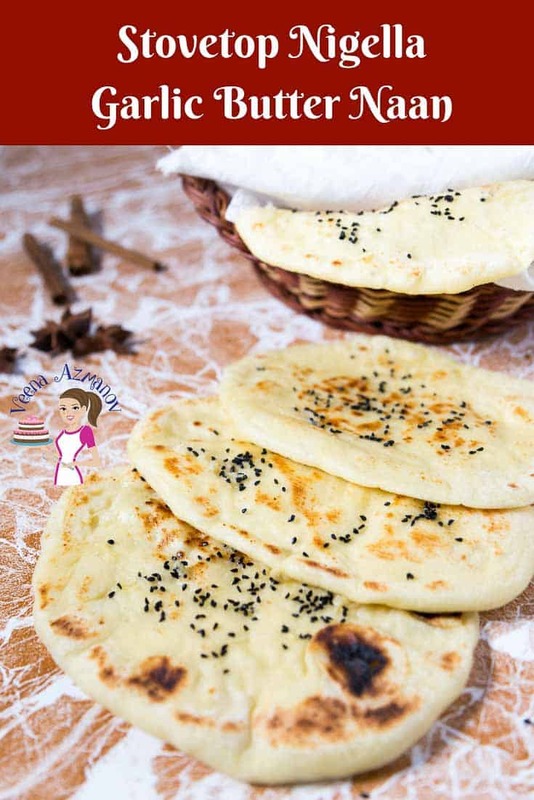 In our home, if I decide to make naan, I have to make both the classic naan recipe as well as this garlic butter naan because my kids will only eat a little of the garlic butter naan. They do want the simple naan bread. 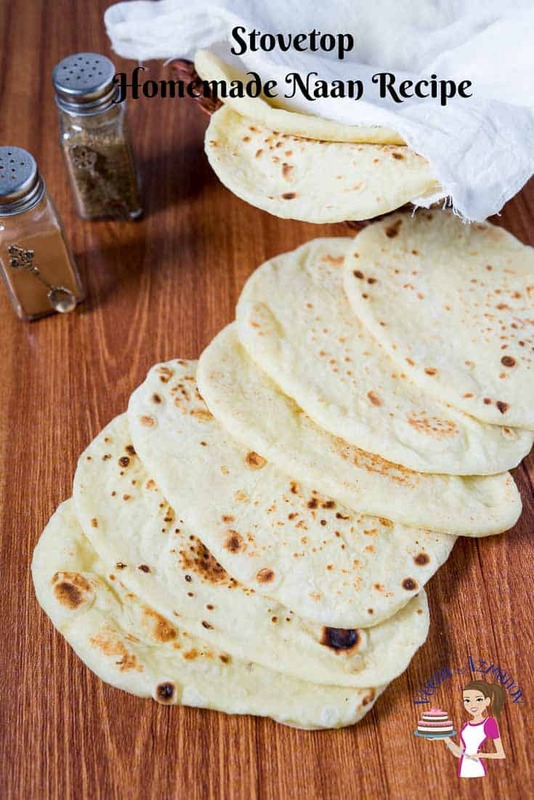 Flour – Naan is traditionally made with all-purpose flour. And yet go ahead and substitute some of that with whole wheat flour. Tastes delicious. I know cause I’ve tried it. I will share it with you soon too. Yogurt – Apart from adding softness and flavor this really helps with over-night fermenting adding a unique special flavor. Try not to substitute. If you must, try non-dairy yogurt like coconut yogurt. I have not tried it myself. If you try, please let us know in the comments below. Egg – Helps keep the naan soft and flaky. If you need to make it eggless, you can replace the egg with 1/4 cup more yogurt. Warm water – the water MUST be warm, not hot or cold. Hot water will kill the yeast while cold water will not revive the yeast. So has to be around 110 F.
Garlic – you must like garlic to be able to eat garlic naan because it does have a rich flavor of garlic. I love adding roasted garlic so my kids can enjoy it too. If you don’t like garlic go ahead and skip the garlic using only butter. Of course, you can also use my basic stovetop naan recipe. It’s always a winner in our home. Butter – Well I do love butter when it comes to naan but yes you can also use olive oil if you prefer. A good baking tray is as important to bread baking as it is to other baking Baking Tray. Therefore, buy a good quality baking tray that’s not too thin. The thick ones will prevent the bread from burning on the bottom. Sometimes you can even add a second tray on the bottom to prevent the bottom from getting burnt. Place the sliced garlic, butter and olive oil in a frying pan. 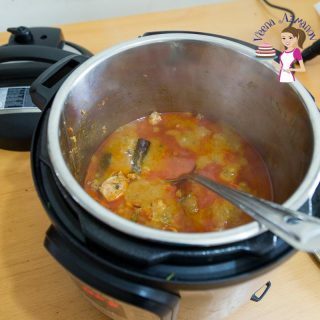 Melt and simmer on low for 5 minutes to infuse the oil. 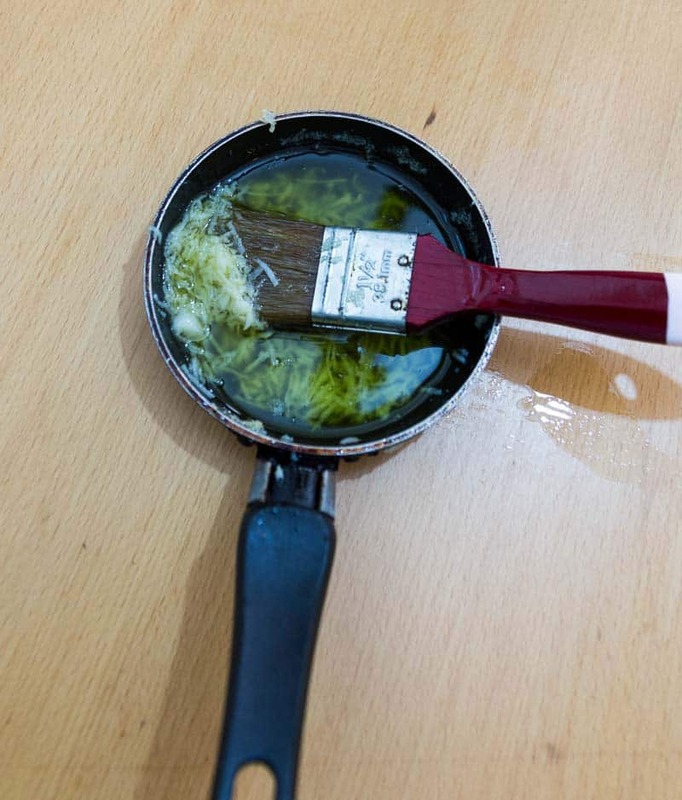 In a measuring cup – add warm water, yeast, sugar, and oil. Let rest for a while until foamy (about 5 minutes). Place flour in a bowl – add salt. Mix well. Add the yeast mixture – start mixing in. Followed by the yogurt and the egg. The dough should be soft and sticky. Continue to knead in a mixer for 3 minutes on medium or by hand on a floured surface for about 5 to 7 minutes. Once the dough is soft and springy. Your dough is ready. Place in an oiled bowl and cover with cling wrap. Rest it out for an hour or two until double in volume. During the resting stage if the dough does rise more than double in volume – just punch down and let rest again until you are ready. Transfer the dough to a lightly floured surface again. 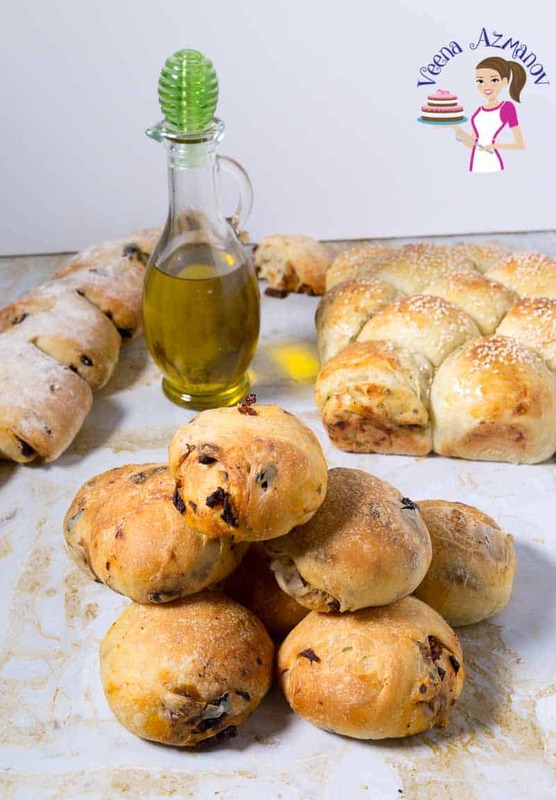 Divide the dough into 16 portions – first in half and then half again, until you have 16 shapes. Roll each into a ball and let rest for 5 to 7 minutes (resting helps the gluten relax and makes working with dough easy). Roll each ball into a round circle shape. Then pull/stretch the circle from one end and you have an oval shape. That’s it!! This oval shape is usually quite characteristic of the naan bread. Heat a skillet pan on high. 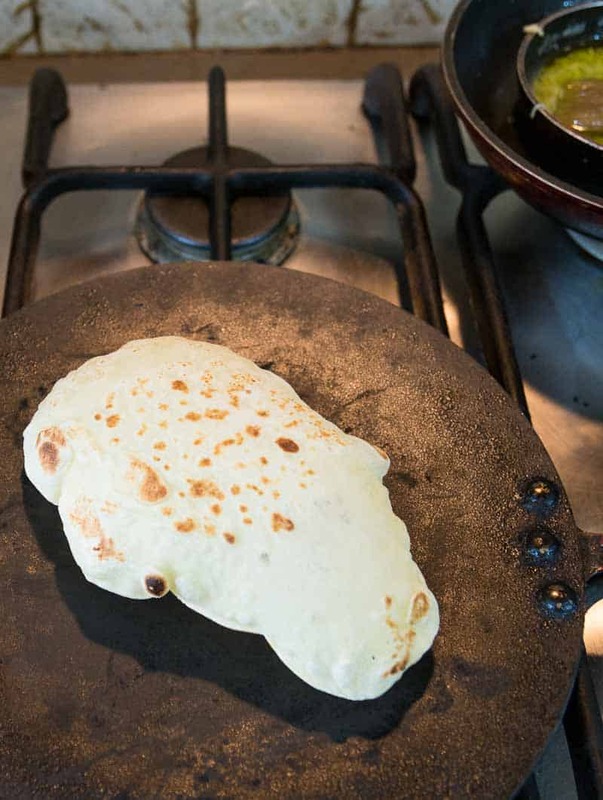 Place the naan on – let cook for 30 secs on the first side – you see some bubbles. The first flip – flip the naan, let cook on the second side for another 30 secs. then the second flip – cook on the first side again for another 30 secs. Third flip – back to the first side again – 30 secs. So you flip three times cooking the naan for 30 secs on each side. Preheat the oven to 220 C/440 F for at least 20 minutes before you put the first naan in. 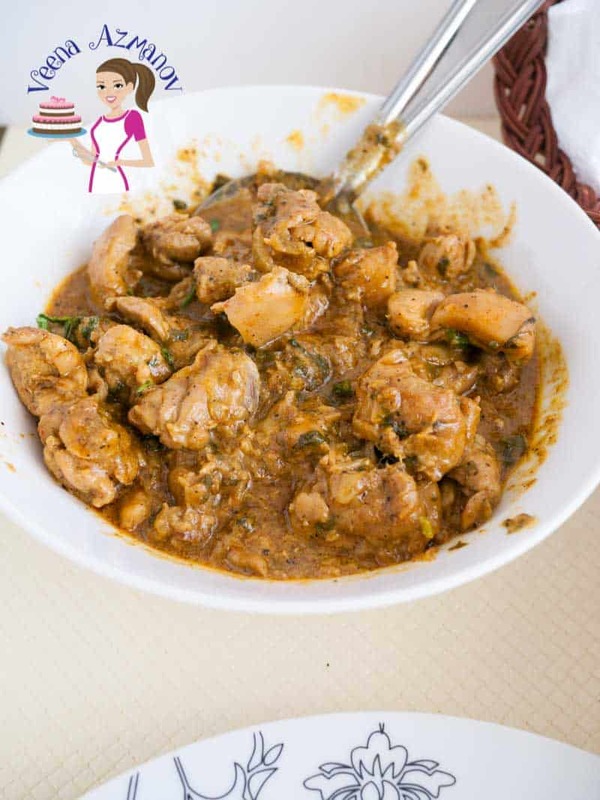 Dust the tray with some cornmeal or flour – place the naan on the tray. Place the tray in the preheated oven on the top shelf closer to the grill for about 2 to 3 minutes turning once or twice. Until you see it’s puffed up and has dark spots. Alternatively, place them on a hot pizza stone at 250C / 500 F – for 2 to 3 minutes. The time of 2 to 3 minutes will vary depending on how HOT your oven is. So keep a close watch. When the naan is almost cooked lightly brush it with the garlic butter mixture on both sides. Sprinkle with nigella seeds which should stick to the oil. As soon as you take the naan off the heat, wrap it in a clean kitchen towel or cheesecloth. This retains moisture back into the naan keeping it soft. The homemade naan is an absolute treat, which when made properly just melts in the mouth. 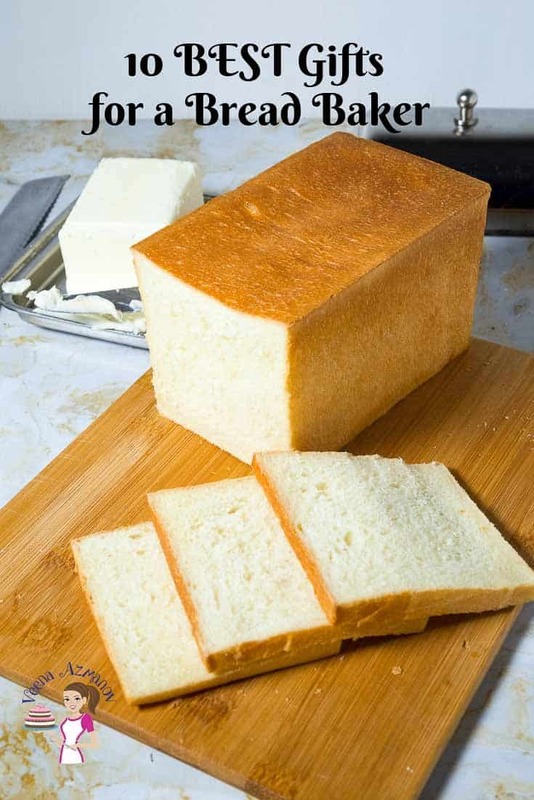 This simple, easy and effortless recipe will make the most deliciously soft and supple bread that can be used to scoop any Indian curry, wrapped around meats. This recipe works perfectly when made on the stovetop, baked in the oven or even grilled on a hot summers day. A garlic butter naan is a variation on the classic Indian naan recipe that often accompanies an Indian meal. 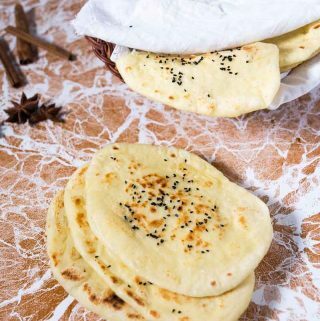 This simple, easy and effortless recipe makes a deliciously soft and chewy garlic butter naan that just melts in the mouth. Set aside, keep warm. Prepare yeast mixture. In a measuring cup - add warm water, yeast, sugar, and oil. Place flour in a bowl - add salt. Mix well. Add the yeast mixture - start mixing in. During the resting stage if the dough does rise more than double in volume - just punch down and let rest again until you are ready. 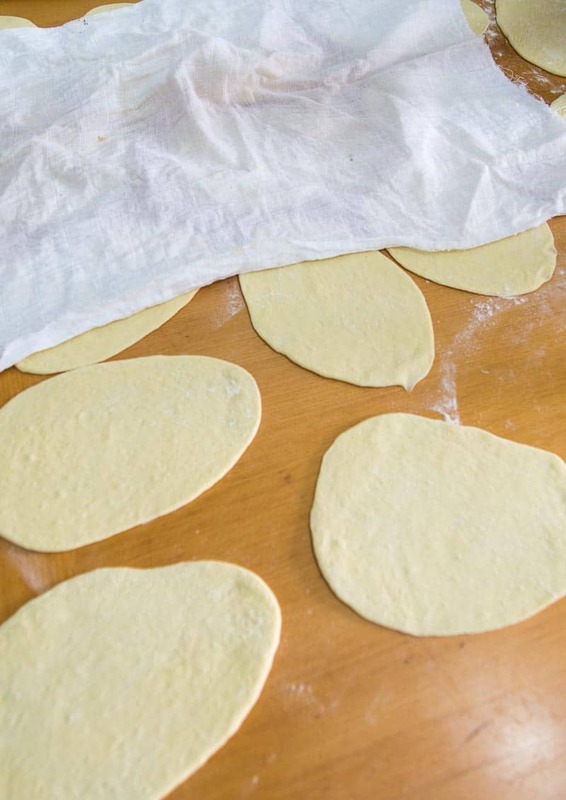 Divide the dough into 16 portions - first in half and then half again, until you have 16 shapes. That's it!! This oval shape is usually quite characteristic of the naan bread. Place the naan on - let cook for 30 secs on the first side - you see some bubbles. The first flip - flip the naan, let cook on the second side for another 30 secs. then the second flip - cook on the first side again for another 30 secs. Third flip - back to the first side again - 30 secs. Dust the tray with some cornmeal or flour - place the naan on the tray. Until you see it's puffed up and has dark spots. Alternatively, place them on a hot pizza stone at 250C / 500 F - for 2 to 3 minutes. Find the perfect gift for the bread baker in your life. 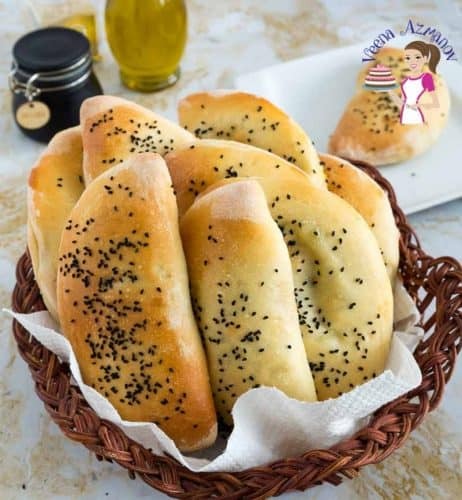 Know a friend who loves to bake bread? 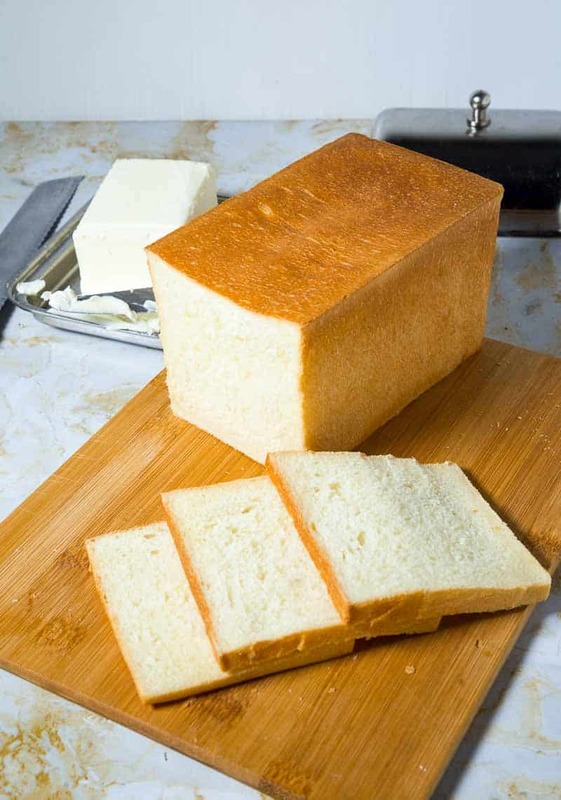 Here are 10 best gifts for bread bakers starting from as low as five dollars. Homemade naan is seriously the best! I can’t wait to give this version a try, it looks amazing! So true Madi. Homemade naan is definitely the best. Thanks Karyn. 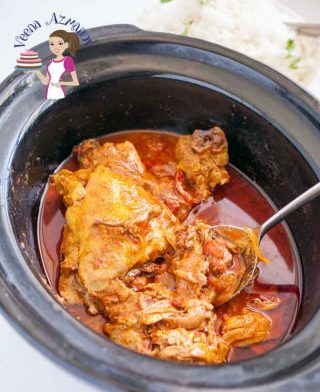 I think you will enjoy this recipe. You must try. Oh your naan looks beautiful! 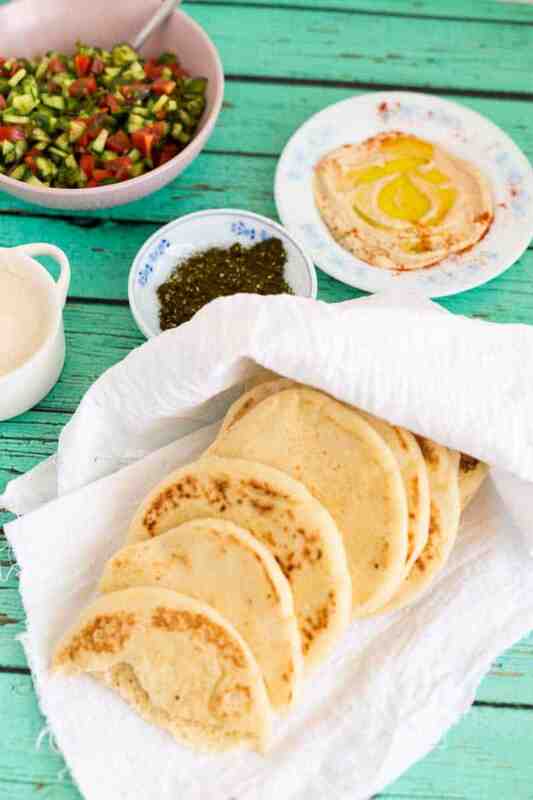 I love making my own flatbreads and the garlic butter sounds wonderful..saving this for later and making soon! Thanks, Catherine. I’m sure you will love this one. I have yet to make naan bread at home. I really need to give this a try. Since I always buy it, I should make it. I know it would be so much better than bought. Oh my, Gloria. 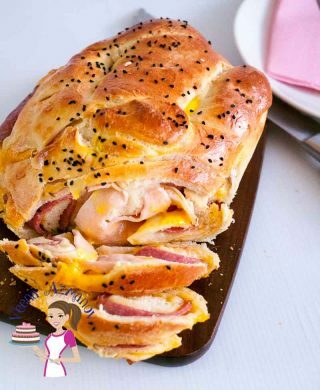 You must try making these. So simple and easy, so much better than the ones you buy from the store. Thank you, Marisa. I do hope you try it. It’s so simple and easy. It really looks soft and delicious. 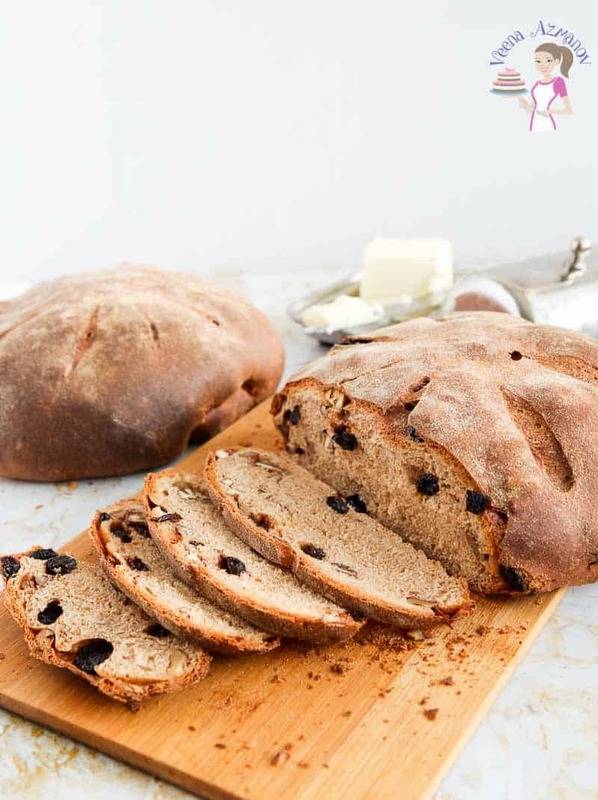 I usually make with whole wheat flour. 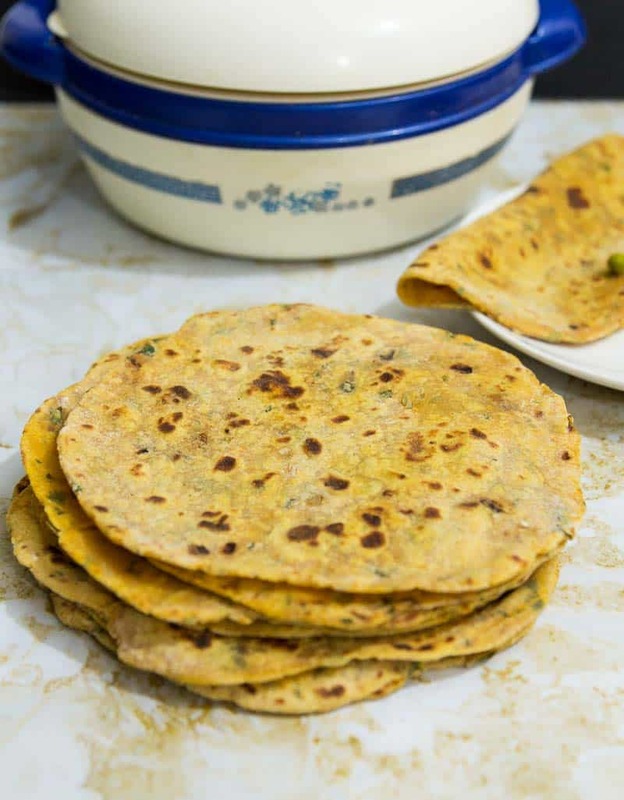 Naan is great for almost anything and we love it in our family. Love the garlic butter topping. Must try that soon. I do make whole wheat naan sometimes too Natalie. Turns out really nice. Wow, such beautifully made naan Veena – they look so soft and fluffy. I hate most Indian restaurant naans — they are so tough and chewy. I guess once we get used to homemade naans, nothing would come closer to taste and texture. Your video is so helpful – thank you! I always love eating naan at Indian restaurants but I didn’t realize how simple it really is to make at home for myself. Thank you, Jaclyn. 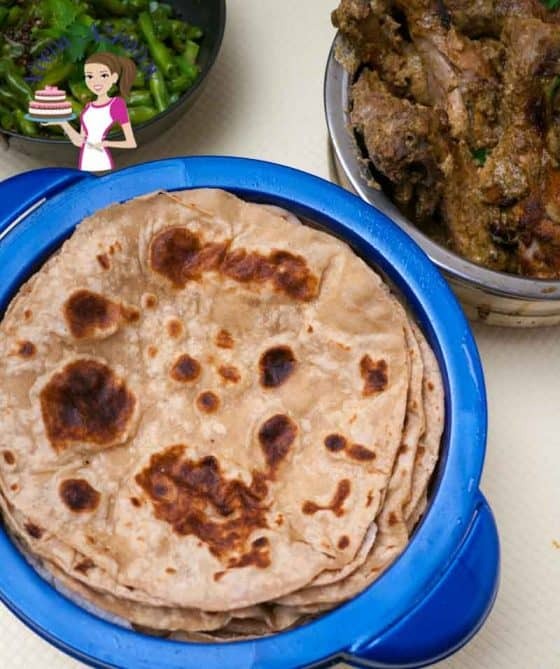 Once you make naan at home you will get hooked, you must try. 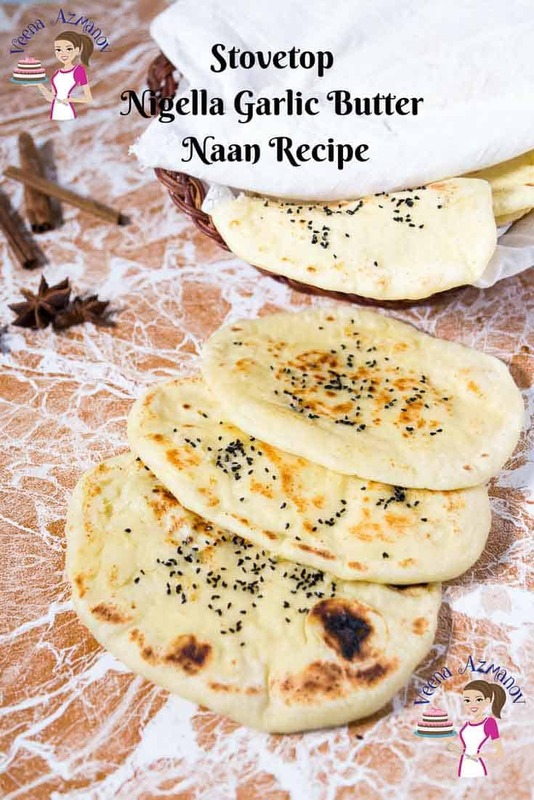 this sounds like a great recipe, Naan costs alot of money in any bakery or grocery and I always wanted to try this. I love the little charr on it and I know that even makes it taste even better. A must put on my to do list ! Thanks for sharing! Thank you Claudia. I hope you try this one. It’s really simple and easy. Yes, naan can be expensive when buying out.